980cc European TR-1 version shown. US model was nearly identical other than the finish on certain trim parts. The XV920's output was nothing remarkable, even for the time, but the engine had all the right specs to be a satisfying, fairly entertaining V-twin sport-tourer. In stock form (like most bikes of the era) the carbs were horribly mis-jetted. There was nothing wrong with the motor that some careful attention to the fuel mixture can't fix. The handling was perhaps slightly better than its Virago sibling, thanks to chain drive, and both had more suspension travel and ground clearance than most of today's V-twin cruisers. The backbone chassis was free of noticable flex, and the 'Monocross'-style rear suspension placement had the side effect of triangulating the swingarm nicely. But the shock and forks were inferior designs that were cheaply made and wore out quickly. The XV920R has aged much better than its square-engined Virago counterparts. It could have been a real stunner, but the bizarre tail treatment and scoopy side covers (functionally needed for cooling the rear cylinder) ruined an otherwise stellar shape. Later European models got a bit better looking. The basic Virago architecture was very solid, and went on to form the basis of many Yamaha models right up through the current V-Star 1100, but square-case motors are now pretty old. The weak spots are the stator and the starter drive mechanism, which are both not terribly hard to rebuild, and can be accessed without splitting the cases. Though it's a rare model in the U.S., most mechanical components are shared with more popular models, and therefore still readily available. Fully enclosed chain is a smart feature. The XV920R may be as good an all-around'er as can be had for the sort of cash they sell for now, although the seat is terrible. Though it looks inviting, the shape puts pressure on all the wrong areas, locks the rider into one position and the padding is too hard. I would much rather have a 920 than a contemporary BMW airhead. It's not really better in most ways, but it's just as good in the ways that matter and it has more style. It just needs some tasteful mods. 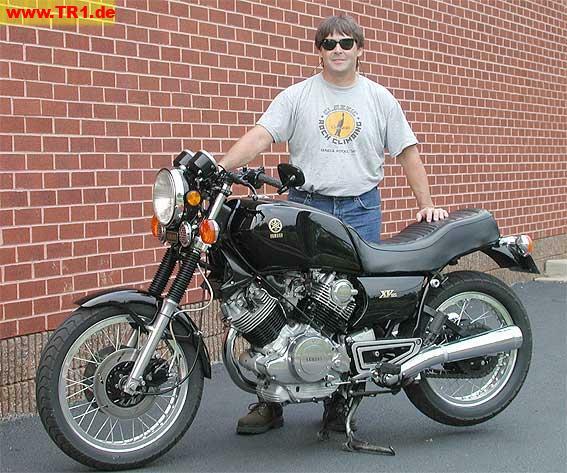 The XV920R should have, in a perfect world, outsold the popular Virago cruiser. The fact that it didn't shows just how much American riders likes cruisers, or how much they hated that rear fender and carrying rack.